I wrap up this month-long look at Astro Boy with a pair of episodes that I simply picked at random from Amazon’s streaming selections (the Netflix discs were all on a “Short Wait,” leaving me with fewer options). Not that episode selection matters a great deal when you’re dealing with a series that has no serialized narrative unifying the episodes. And it’s of course trickier when the U.S. dub of the series ran for 104 episodes, leaving 89 episodes that never saw broadcast in the country that were still produced by Mushi. So let’s start with “Cape Town Lullaby” / “The Hooligan Whodunit.” The episode returns us to an earlier theme, that of robot discrimination and hatred. We have a man who has started a gang of anti-robotists, and they go about the world destroying robot factories and other such locations where robots (and humans as well, it would seem) would congregate. It’s all because this man, Horace Hooligan, lost his mother when he was very young, and assumed that robots were the cause of her murder. This stance, of course, is refuted by our various protagonists. Astro and Higeoyaji both point out that robots simply don’t attack people, that they don’t perform those sorts of violent acts. They think there must be some other reason for Hooligan’s behavior. They get a lead in the form of a disassembled robot whose memory box indicates that the Hooligan gang may be hiding out at the South Pole. Through the course of events, including a Hooligan-led assault on a robot-maintained whale ranch, the gang’s members begin to dwindle as they realize that robots aren’t the violent maniacs that Hooligan has led them to believe. 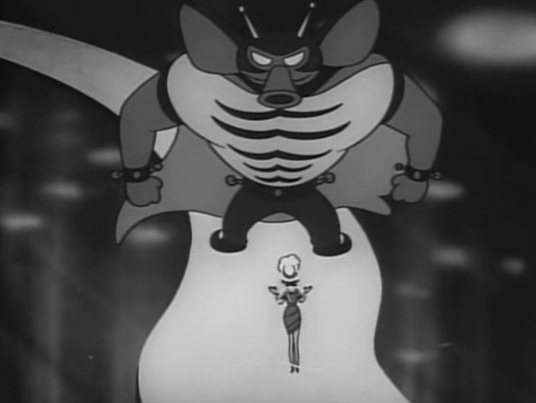 The robot whale ranchers tend to injured members of gang, and then Astro Boy manages to stop an elephant stampede. 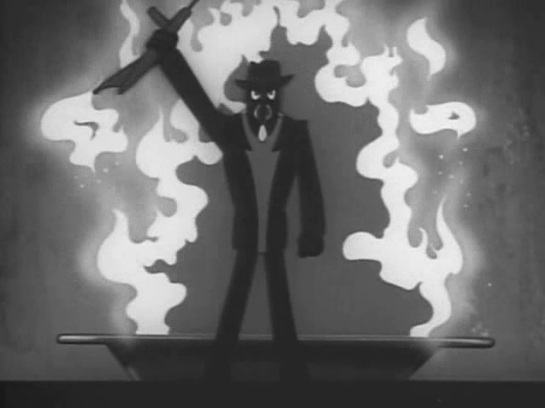 (Yes, it’s random; the dub removed the original South African setting, changing Cape Town to Tacit Town. It’s also rather violent as Astro wails on the animals, including knocking one into the atmosphere.) That’s the final straw, assuaging their anti-robotism and leaving Hooligan without a gang. Which leads to a tough showdown between Hooligan and Astro. It’s well animated, and generally more suspenseful than other fights on the series thus far, possibly because it had to be creatively edited as it’s a fight between a human and robot. But the episode isn’t without a big twist. The disassembled robot from the start of the episode turns out to be Horace’s mother. The humans of the town were the ones who destroyed her, and in his sadness, young Horace assumed that her remains belonged to the robots that had killed her. It’s an emotional reversal, and it actually works really well. It called back, for me, the similar sort of emotional twists that Batman: The Animated Series pulled off with such ease. “The Dreaming Machine” is a much more straightforward episode, though it still has a little emotional moment that provides a sort of button to end our discussion on. Here, a doctor has created a machine that will allow robots to dream, and Astro gets to test it out. It results a chain of dreams involving the good doctor who made the machine, his daughter, and the unsavory man who wants to steal the machine. It’s a fun mix of tales that involve a dreamscape, an Arabian setting, a jungle adventure (with a robot rabbit), and a Western, and everyone’s chasing after a magical musical box that can grant wishes. But the dreams conclude with Astro getting to make a wish. He wishes to be human (of course, he wakes up as he makes the wish). The wish, of course, calls back to the Pinocchio story that is an undercurrent to all of Astro Boy. Astro wants to be human even though being human means struggling in a world that, even as this series makes clear, isn’t as cut-and-dry morally as Astro’s actions are. It’s messy and complicated, and there’s something noble about Astro’s desire to be messy and complicated himself, a reminder that if a robot could want that, we should be able to handle it. A friendly reminder that next week begins our Wonder Woman coverage. Kerensa and I will start with the pilot movie, The New Original Wonder Woman from 1975. If you’d like to watch along with us, the series is available on DVD, iTunes and Amazon, and you can also stream it for free on TheWB.com.